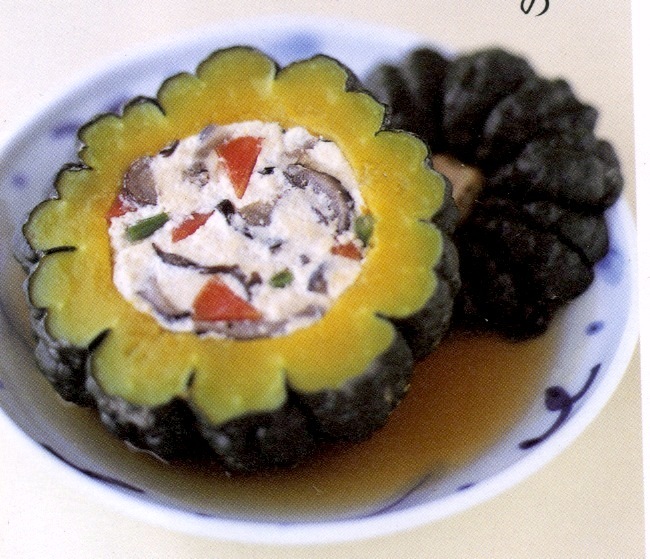 This is Genbo Nishikawa’s recipe for tofu & vegetable stuffed mini-pumpkins. (6) Pour some of the warm kuzu-an sauce into the base of a bowl and then place the pumpkin on top. This is a translation of part of an interview with Genbo Nishikawa, shojin-ryori chef and teacher, and abbot of Torin-in temple in the Myoshinji Zen temple complex in Kyoto. 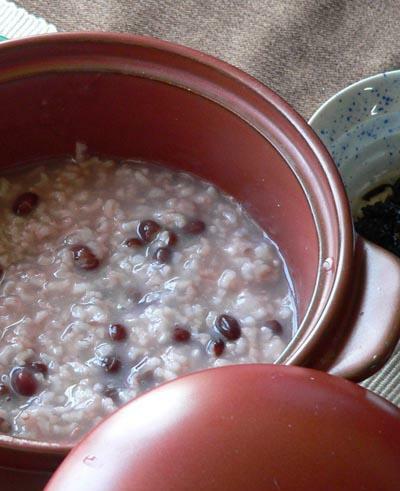 Nishikawa-sensei has also written many books on shojin cuisine. Q. 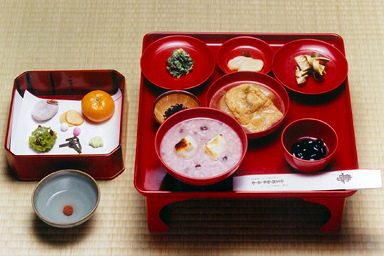 When someone says “shojin cooking”, the image is of the simple food that Buddhist monks eat that doesn’t contain any meat or fish, but what does it really mean? A. Originally, “shojin” was a Buddhist word that referred to a total commitment to the ascetic practices that would lead to enlightenment. Even though human beings have continued to survive, unless something gives us life, we cannot survive. And so, in the spirit of the Buddhist proscription against taking life, not only should we be aware of taking care of all living things but we must fully value those lives upon which we depend for life. That is the essence of shojin cooking. Q. So you mean that everything related to food is also considered as “shojin” in the sense of being a spiritual practice? A. In Zen training, preparing food or eating food is just the same spiritual practice as sitting on a cushion and meditating. In the 13th century, Dogen Zenji, who was the founder of Zen Buddhism in Japan, adopted this way of practice. In recent times, we see athletes in much the same way, as being completely committed to their sports practice. When you are focussed on sport, be completely absorbed in sport, and so it should be with everything you do. Q. In order to fully value the living things that we eat, isn’t it also taught that we should utilise everything and not waste anything? A. Well, even though it is really important to make the best use of all the ingredients, you still have to peel the skin off some vegetables. But even so, not only do we tend to quite unconsciously and carelessly throw away the leaves and roots, but we don’t stop to think about how we might be able to fully utilise those vegetables skins as well. Q. Well, it seems that this is all connected with the Buddhist precept of respecting life and not killing, isn’t it. So, what’s the basis upon which you choose what ingredients to use? A. In Japan, the four seasons of summer, autumn, winter and spring are really clearly defined and with each season comes a variety of ingredients that are full of nourishment and which will appear in the marketplace quite cheaply when they are in season. It is these seasonal ingredients that I use. Nowadays, everything seems to be available all year round, but I think this is very strange. That’s really not making the best use of Japan’s climate and natural local features. But recently, because of the rising popularity of “local production for local consumption” and terms such as eco-friendly are becoming more widely used, the preciousness and importance of life seems to be talked about more often. But actually, Dogen Zenji was saying the same thing 850 years ago! Q. Being aware of “local production for local consumption” and being eco-friendly is really important for the environment too, isn’t it? A. Yes. Paying attention to the seasons, buying locally grown produce, making less rubbish, saving petrol by not driving too far – being aware of these kinds of things is what “eco-friendly” really means. I think that if we simply keep on preserving this traditional Japanese food culture that we already have had for centuries, such as only eating food that is in season, then we will not be contributing to the bigger issues now facing us such as global warming and the destruction of the environment.